The media industry's wholesale takeover of creativity is the real piracy. We’ve heard a lot about “piracy” in the last few months. But as you’d expect, there’s a lot of confusion, particularly by the folks doing the name-calling, about what pirates really are. Pirates aren’t petty thieves, snatching a video or two from the local video rental shop. Pirates were (and are) after the big kill: the galleons filled with gold from the new world, the oil tanker that can be held for a few million dollars in ransom. If we’re going to talk seriously about piracy, it’s not kids downloading the odd song or TV episode, nor is it third-world software developers downloading the ebooks that I’ve edited and written. That’s shoplifting at worst, and while I’m not going to condone shoplifting, it’s a cost of doing business, and not a particularly large one. As Tim O’Reilly has argued, and as O’Reilly’s sales indicate, the additional exposure you get through piracy more than compensates for any “lost sales,” especially since the sales you lose are the sales you were never going to make in the first place. Sites that sell copyrighted music that they have not been licensed to sell are a more serious problem, but again, this is a problem that’s easily solved by making your work as widely available and as easily accessible as you can; this will put parasites out of business. That’s not to say that piracy isn’t an issue. Just that it’s a different issue than the one the MPAA wants us to think about. 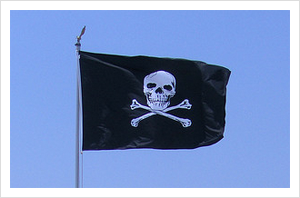 There is some major league piracy going on, and it’s all about the abuse of copyright by the major copyright holders. It’s hard to think about Righthaven except as an instance of piracy. (And Righthaven ended up where most pirates historically ended up.) The Digital Millennium Copyright Act (DMCA), which has been widely used to suppress parody, unfavorable reviews, and the like, was a huge intellectual property land grab that fully deserves the name “piracy.” At O’Reilly, we had a narrow escape a few years ago. “Head First Java” starts each chapter with an image taken from an old movie for which the copyright had expired, placing the movie in the public domain. Someone collected several of those movies into DVDs and copyrighted the DVD. Luckily, we discovered it (and were able to find new images) before we published the book and ended up with a court summons. That too is piracy. So is much of the patent trolling that’s currently going on: one small but particularly painful example is Luma Labs’ decision to take their product off the market because of a worthless patent claim. They determined that they’d almost certainly win in court, since their product was demonstrably based on prior art going back to 1885, but they’d almost certainly go bankrupt paying the legal fees. The Stop Online Piracy Act (SOPA) and the PROTECT IP Act (PIPA) have to be understood in this light: it’s just another IP land grab. It’s an attempt to frighten those who would compete with the established media companies, an attempt to assert monopolistic control over creativity. The ability to take domains offline without due process, even on the basis of inadvertently linking to copyrighted material, is nothing if not an attempt to legitimize theft on a grand scale. Because there is no due process, a defendant can’t respond until he’s already out of business; and then, it’s a matter of whether the defendant can outlast Hollywood in their ability to pay legal fees. “Justice” is meaningless if you run out of money before you get to the end of your case. Let’s look at what would have happened historically if we had today’s copyright regime. Many of Shakespeare’s plays are based on older works. Many of the histories go back to Holinshed’s “ “Chronicles of England, Scotland, and Ireland,” and if you’ve read Holinshed and Shakespeare side by side (I have), there’s more than just an occasional chance echo. What would Shakespeare have owed to the Holinshed family? Would they have been able to take him “offline” under the DMCA? “Hamlet” is believed to be based on a lost, earlier “Hamlet” (called the Ur-Hamlet, possibly written by Thomas Kyd, one of Shakespeare’s contemporaries) that has been lost. With modern IP law, we’d still be paying royalties to the unknown author of the Ur-Hamlet, and we wouldn’t have Shakespeare’s masterpiece. Then as now, borrowing wasn’t limited to theatre. Mashups, which have been repeatedly attacked by the entertainment industry, are by no means a new art form; they’ve been central to creativity for years (related examples are embedded below). Bach’s “Goldberg Variations” incorporate a number of popular songs of the era, including the always popular “Cabbages and Beets drove me away from you,” in its entirety, along with “Get closer to me, baby” (that’s what the German really means, except the “baby” part). So did Beethoven’s sonatas, particularly the second movement of the magnificent Opus 110 piano sonata (“Our cat had kittens” and “ I’m a slob, you’re a slob“). I could list examples for pages; musicologists spend entire careers searching for this stuff. The complexity with which these songs are woven into a much greater piece is amazing, but they’re there, they’ve obviously there once you know what to look for, and they go way beyond what would survive “fair use” and the DMCA, let alone SOPA and PIPA. So the notion that creativity can be owned, and that any use of someone else’s ideas requires compensation, is nothing but an attempt to steal all of creativity. Whoever can pay their lawyers the most wins. Anyone smell pirates in the room? I am not willing to sacrifice this generation’s great artists on the altar of Hollywood. I’m not willing to have the next Bach, Beethoven, or Shakespeare post their work online, only to have it taken down because they haven’t paid off a bunch of executives who think they own creativity. The Constitution of the United States provides a legal basis for copyright and patent, but it’s for a specific purpose: it’s “To promote the Progress of Science and useful Arts.” We’ve gone way beyond that now, with patent and copyright piracy: our notion of intellectual property is now hindering both science and art. In Book IV, section 4, of St. Augustine’s “The City of God”, Augustine tells the parable of a pirate captain who is captured and brought before Alexander the Great. The emperor says “How dare you terrorize the seas”? The pirate captain replies, “How dare you terrorize the whole world? Because I only have one ship, I’m called a pirate; because you have a great navy, you’re called an emperor.” The difference between a pirate and an emperor is one of scale only. And that’s the position we find ourselves in here: the Motion Pictures Association of America (MPAA) and its allies have twisted the discussion so we’re talking about the wrong thing. We shouldn’t be talking about the small-scale piracy of individual movies (which probably helps sales in the long run, as we’ve observed in the publishing business). We should be talking about the real piracy, the wholesale takeover of creativity by the media industry. That’s the piracy we should be outlawing.